When springtime rolls around each year in Southeastern Massachusetts and Rhode Island, we most often hear about flea and tick prevention, as well as testing and heartworm treatment for dogs. While these are very important and should not be understated, there are other things that you can also do to protect your pets and keep them safe during this busy season. Your veterinarian in South Coast at Anchor Animal Hospital wants you to have all of the information necessary to keep your pets happy and healthy. The more you can learn as a pet owner, the better equipped you will be to take care of small issues before they become big problems, providing your pet with all of the safe care required to live a long and healthy life. As soon as the weather turns nice here in the South Coast, homeowners naturally get outdoors and start working on their landscaping. Planting flowers, adding fertilizer to lawns, spraying weed killers – these are all necessary chores in order to create a beautiful garden and yard for the season. Unfortunately, many of the top mulches that are used today for their color and texture are actually toxic to pets. One of the most popular, known simply as “coco mulch,” but sold under multiple brand names, contains many of the same properties as chocolate, which is toxic to cats and dogs. This mulch, if ingested, can cause many serious medical problems. If you must mulch, don’t use it in the area that you have created for your pets to use when outdoors and never purchase coco mulch, for the benefit of all neighborhood cats and dogs as well. Fertilizers and weed killers can also be very hazardous to pets. Consult with your veterinary clinic in Dartmouth for ideas of smart solutions to combat weeds and pests that won’t harm your pets. Consider natural remedies, such as planting marigolds, which repel insects and other pests without being a harm to local animals and pets. If you aren’t sure about the products that you have already used on your property or if you want to hire a professional to take care of fertilizing and weed killing, make sure to express your concerns and ensure that the chemicals that will be used won’t be harmful to your pets or other animals in the neighborhood. If your pet comes in contact with any chemicals used in landscaping, bring them to see your veterinarian in South Coast immediately. Another hazard that many pet parents aren’t aware of are puddles and other types of standing water that can follow a good spring shower. This is one of the most important seasonal pet tips that you need to remember that will help you in prevention of other issues. One problem with any type of standing water is an increase in mosquito populations in the area. Heartworm treatment for dogs is important no matter what the seasonal conditions, but preventive measures to reduce the insect population are also beneficial. Another problem with standing water is that puddles can quickly become populated with bacteria. Many pets will be tempted to drink water from puddles, but this can cause upset stomachs, diarrhea and other serious issues. If your dog likes to drink from puddles on walks around the block, bring a portable dish and a water bottle with you as a healthy alternative. Make sure you don’t have any puddles or standing water in your backyard or kennel area when your pet is outdoors on his own. Check these areas daily to prevent illness and mosquito population growth. So if those April showers and the puddles they leave behind weren’t dangerous enough, the spring flowers that come from all that gardening and seasonal rain can also be very toxic. 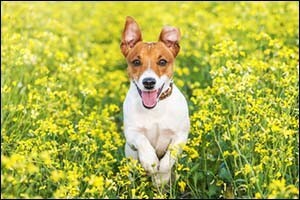 In fact, some of the most beautiful and popular choices in springtime blooms can be dangerous to your pets. You might be surprised to know that tulips, lilies, azaleas, ferns, irises, morning glories and hyacinth are some of the most toxic plants found in gardens all across the country today. Also include clematis, bittersweet, foxglove and rhododendron, four more popular plants that are also dangerous to pets. If you aren’t sure, consult with your veterinary clinic in Dartmouth for seasonal pet tips about outdoor and indoor plants that are toxic. You can also go online for a complete list of safe and unsafe plants to use around pets that you can keep with you when you visit the garden shop for your landscaping supplies. In addition to outdoor issues, there are indoor problems as well. The annual spring cleaning festival that many partake in can bring its own share of hazards. Look for cleaning supplies that don’t contain chlorine, bleach, ammonia, paraben or phosphates for best results around pets – and people. There are a lot of affordable eco-friendly cleaning supplies on the market today that you can use to get your home clean and ready for the season. If you think your pet may have ingested something toxic or dangerous, or if you have other seasonal concerns such as heartworm treatment for dogs and other preventive measures, contact Anchor Animal Hospital at 508-996-3731 to schedule an appointment or to learn more about our veterinary clinic in Dartmouth. As a veterinarian in the South Coast, we provide treatments and services for pets throughout Southeastern Massachusetts and Rhode Island.